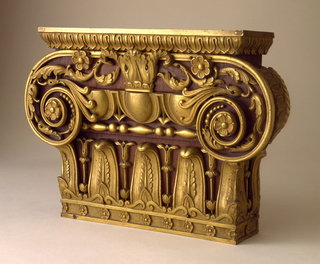 See more objects with the tag interior, borders, wallcovering, floral, classical, symmetry, hardware, cable molding. See more objects with the color midnightblue saddlebrown chocolate chocolate maroon or see all the colors for this object. This is a Border. It is dated 1810–20 and we acquired it in 1928. Its medium is block-printed on handmade paper. It is a part of the Wallcoverings department. pen and black ink, brush and wash, graphite on paper.